If you look online for the ships currently in the Cunard fleet, you’ll find only three, the Queen Mary 2, the Queen Victoria, which came into service in 2007, and the Queen Elizabeth, first sailing in 2010. Of the three ships, the Queen Mary 2 is listed as an Ocean Liner. The other two are termed cruise ships. We’re not sure what the distinction is, but we’ve heard it said before that the Queen Mary 2 is an Ocean Liner, not a cruise ship. There was another Queen Elizabeth, called the Queen Elizabeth II, which made her maiden voyage in 1967. She was in service until 2002 and is so far the longest operating passenger ship ever, with over 5 million miles of travel. She was the Cunard Flagship until her retirement. That title now belongs to the Queen Mary 2. In 1839, Samuel Cunard, from Prince Edward Island, partnered with Robert Napier to form the British and North American Royal Mail Steam-Packet Company. They had won contracts to carry mail across the Atlantic from England to Halifax and Boston. They started with four steam powered paddle ships, and built an empire from there that lasted until the beginning of aircraft service across the Atlantic in the early 1960s’. Beginning in the first part of the 20th century, there was a speed war of sorts between cruise liners from England, France, and Germany. Each country competed to build the fastest ship. Finally, the Queen Mary (the original Queen Mary) set a record of 30.99 knots during a crossing in 1938, still hauling the mail. 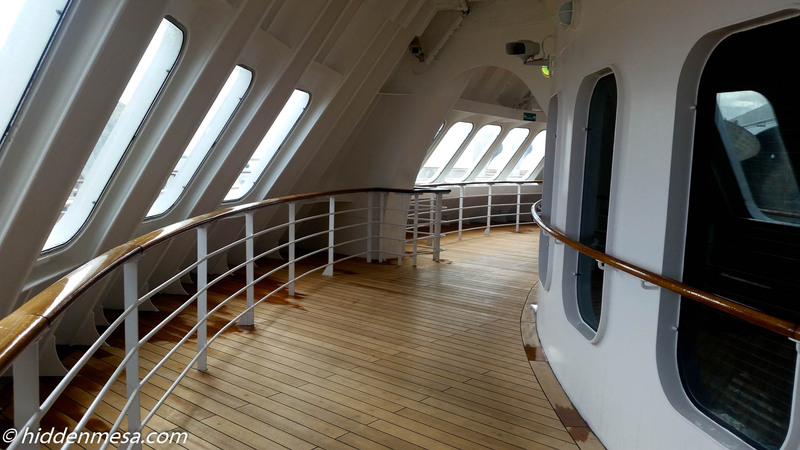 To put this into perspective, we’re aboard the new, modern Queen Mary 2. We’ve been averaging 21 knots across the Atlantic so far, which we thought was reasonably fast. No doubt we could go faster if the Captain wanted, but we’re not trying to break any records. Still, 31 knots might be a bit out of our reach in this ship. Cunard has had a unique history with the British government. Since the early days of hauling mail, the relationship has been one that allowed the ships to be converted into military machines when needed. In fact, it’s a Cunard ship, the original Queen Mary, that still holds the record for the most personnel carried at over 16,000 troops, which was set in World War II. Keep in mind that the original Queen Mary weighs in at just under 81,000 tons, while today’s Queen Mary 2 is over 151,000 tons. You can still see the original Queen Mary. She’s still afloat, but converted to a hotel, in Long Beach, California. Looking down at the Grills Terrace and the Minnow Pool. Photo by Bonnie Fink. Cunard was purchased by Carnival in 1998. 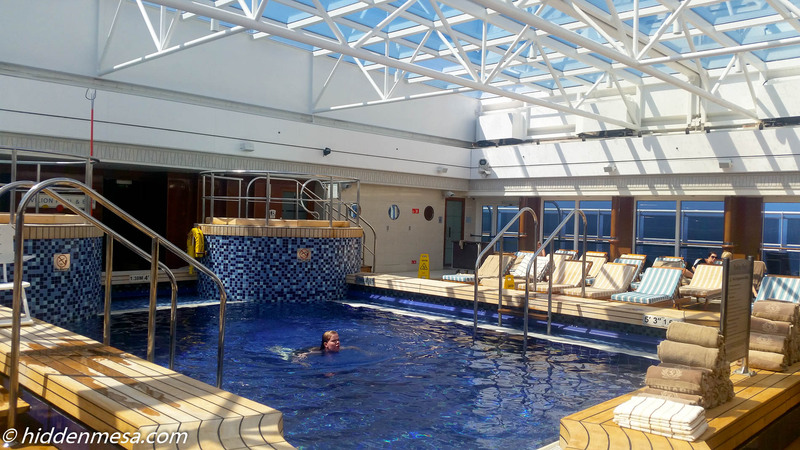 Carnival has several cruise lines and they have made it a point to keep Cunard in their niche, which is one of maintaining the elegance and grace of cruising the world’s oceans in luxury and style. 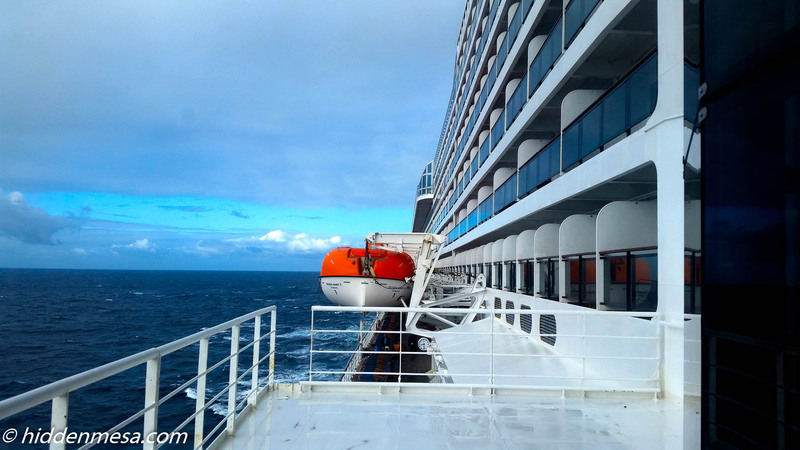 Many of the things cruisers have come to expect aboard a typical ship cruising the Caribbean, for example, aren’t found aboard a Cunard ship. 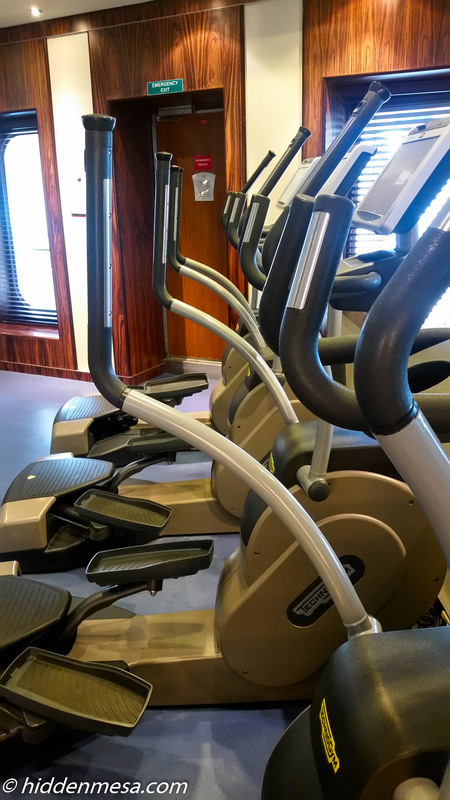 There won’t be any Zumba classes like we found on the Norwegian Epic, nor will there be dancing parades of Shrek and Friends like we saw on the Royal Caribbean Line’s Liberty of the Seas. Not that there’s anything wrong with Zumba and Shrek. They’re just not on this ship. 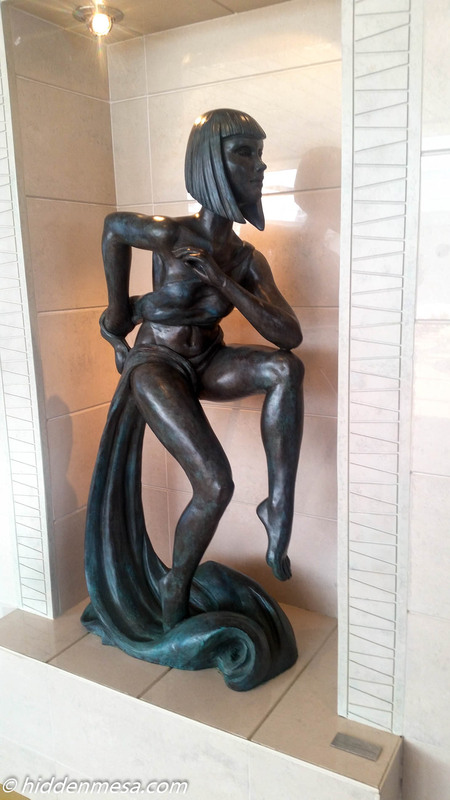 But on the Queen Mary 2, or any of Cunard’s other ships, you’ll find a high elegance that strives to match the luxury that began nearly two centuries ago. On most ships, where you find tiled floors, you’ll see carpet on the Queen Mary 2 in keeping with the décor of a time long ago. Make no mistake about it, the carpet is not old, nor is it worn. In fact, it’s nearly new. But the style is of a time long ago. It’s kind of the point. You’ll even see a hint of class distinction in passenger accommodations, but to be truthful, there isn’t any more class difference in Cunard’s passenger structuring than any other cruise line today. There used to be a first class, second class, and tourist class aboard not just Cunard, but any of the ships of the day. 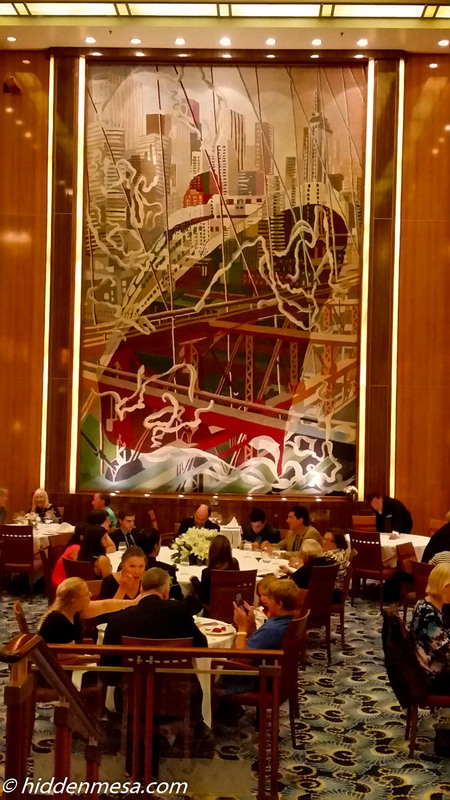 Aboard the Queen Mary 2, there’s just one main dining room. Well, sort of. There’s also dining facilities and lounges for folks staying in suites, but that’s really not unusual. 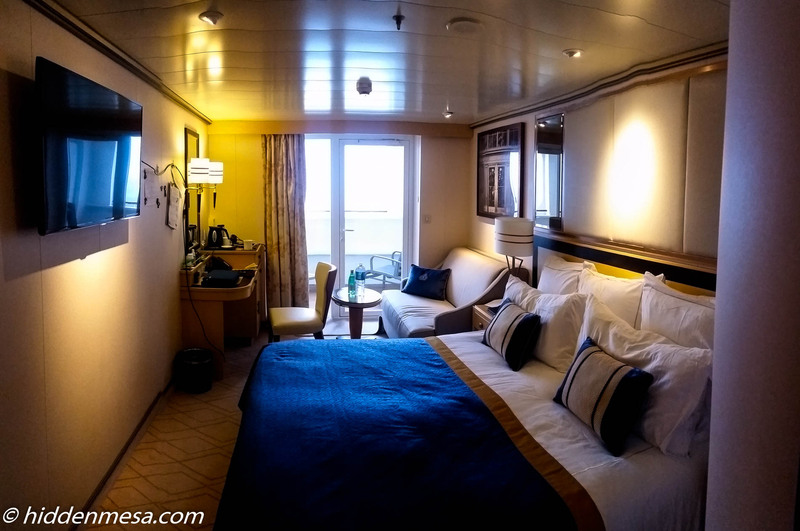 We have special privileges aboard Royal Caribbean ships, not because of the rooms we stay in, but because of the number of cruises we’ve made, so the class distinction is there in pretty much all cruise ships. Speaking of which, have you tried to board an airplane lately? With all the class distinctions there, you’d better pay attention lest you find yourself in the wrong line being admonished severely by the gate people. 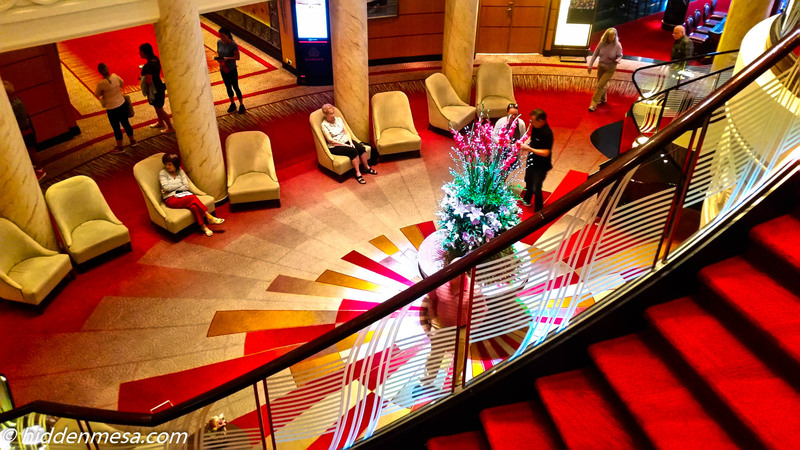 Cunard is more formal than other cruise lines. This is intentional as they work toward maintaining a certain decorum. On this crossing, it takes seven days. There are three formal dining nights. Seven day cruises would normally have only one or two formal nights. But the part where they want to maintain their decorum comes by asking men to wear at least a sports jacket—necktie optional—on non-formal nights. 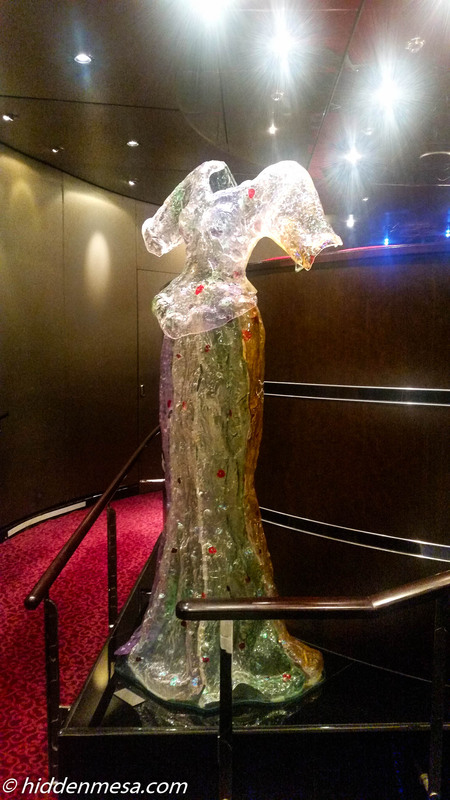 At any other time the dress aboard this ship seems to be the same as any other cruise ship. Except that at the moment we’re in the North Atlantic, and, well, it’s cold outside. Shorts are being worn by the die-hard, “I’m on vacation and I’m gonna wear shorts” kind of folks. But the rest of us know it’s cold. 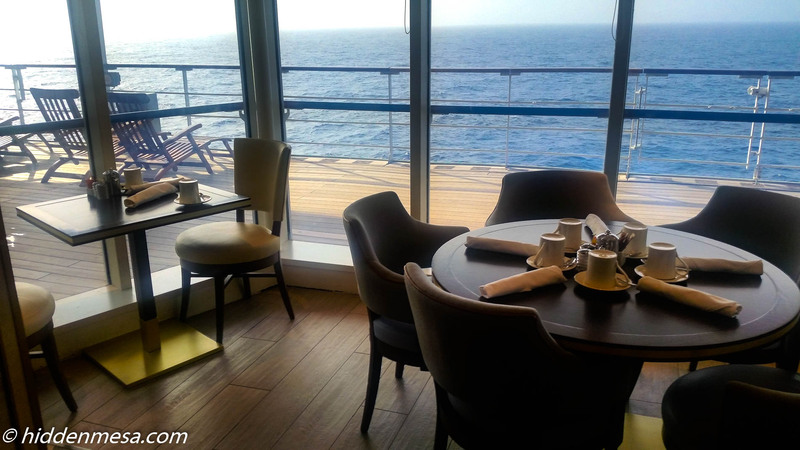 The food aboard the Queen Mary 2 is a cut above most other cruise ships we’ve sailed. They’re especially good at desserts, which is good, because we’re especially good at seeking out and eating desserts. Many of the main dishes we can’t pronounce, but there’s always a hamburger, hot dog, or pizza. So like most other cruise ships, there is always something to eat, no matter what your mood might be. 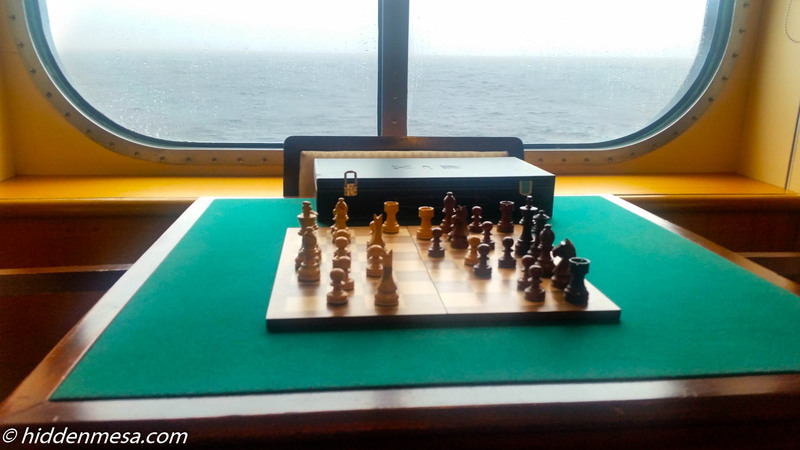 This is our second Atlantic crossing aboard the Queen Mary 2. It will no doubt not be our last. We’ve come to enjoy crossing the Atlantic the old, slow way, by ship instead of flying. And as far as we know, Cunard is the only line that has regular service across. 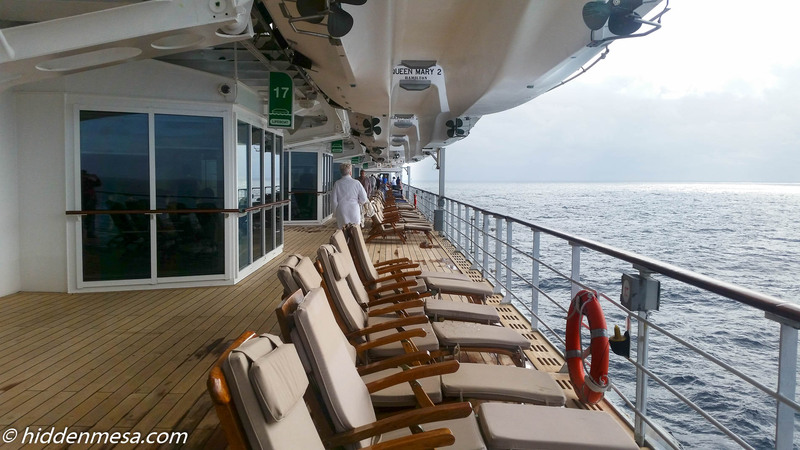 Other cruise companies have re-positioning cruises twice a year, and we’ve made a few of those, but Cunard is the only company that seems to specialize in this service. 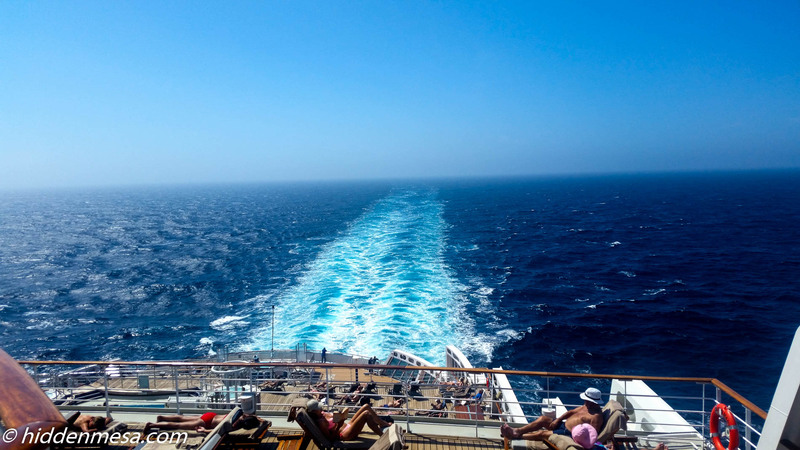 It would be irresponsible to put up an article about cruising and not mention this, but for those of you who have not been on a cruise, this is not the cruise for you. We’re making this crossing in seven days. Keep in mind that this means that we’re at sea for seven days. So far, we’re in day five of this cruise, and we haven’t seen another ship since the very first night when we saw some lights way out on the horizon. This is not unusual. It’s a big ocean. We’re all by ourselves out here. If weather comes up, we’re in that too, although the ship is more than capable of handling anything the Captain will take us through. We recommend that you make your first couple of cruises on something a little closer to home, or at least on a ship that makes a stop every once-in-awhile. 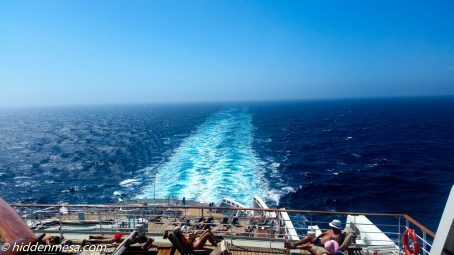 If you learn that you like being on a ship, then by all means, join us with an Atlantic crossing. 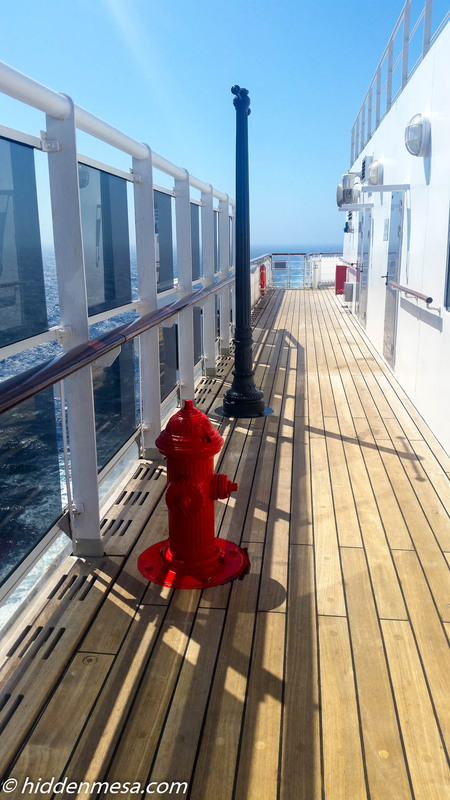 We can’t think of a better way to get across the ocean and are grateful to Cunard for still providing this elegant and luxurious way to travel. 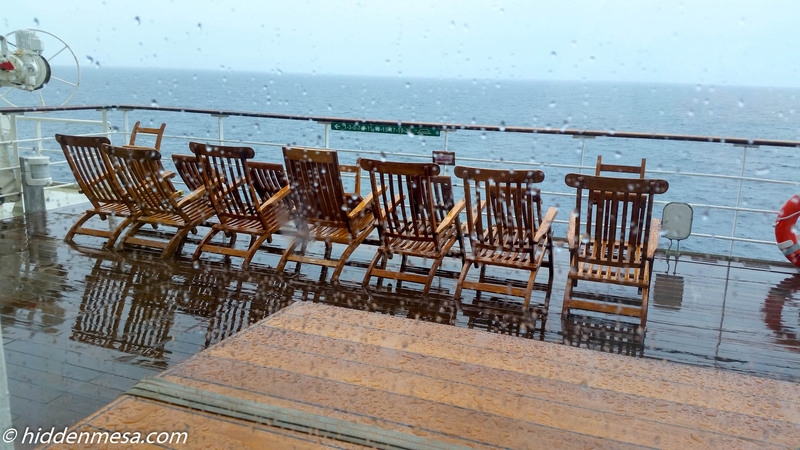 We posted another story about crossing the Atlantic aboard the Royal Caribbean Liberty of the Seas during one of her repositioning cruises. You can see it here. 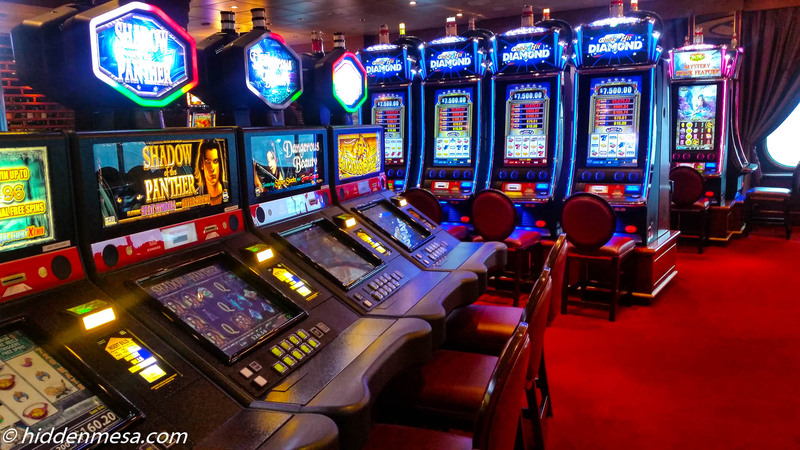 Slot Machines on the Empire Casino. Photo by Bonnie Fink. 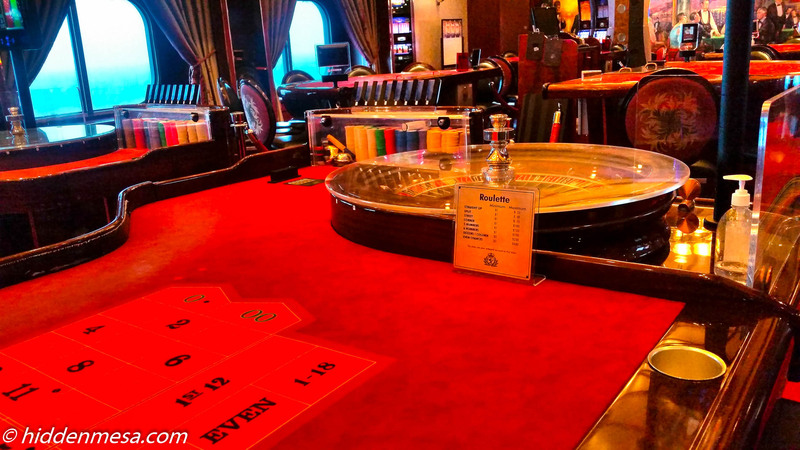 Roulette Table in the Empire Casino. Photo by Bonnie Fink. Art work at the Royal Court Theater. Photo by Bonnie Fink. There is a nice area set up with different games you can enjoy. Photo by Bonnie Fink. A standart Balcony Room. Photo by Don Fink. 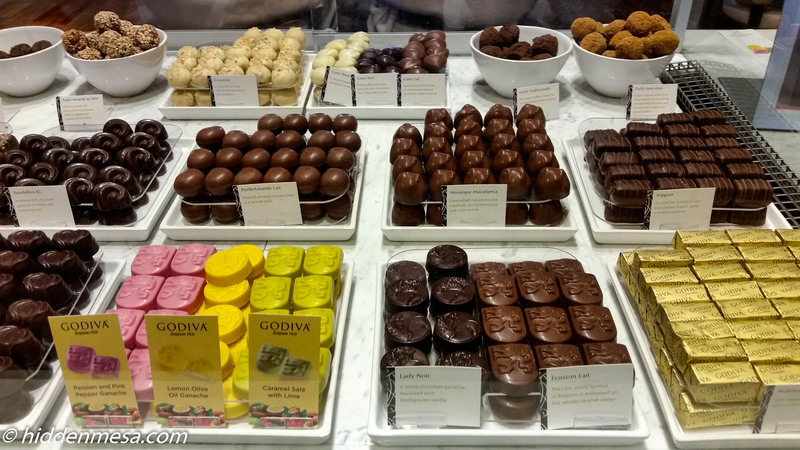 Godiva Chocolate in Sir Samuel's. Photo by Bonnie Fink. 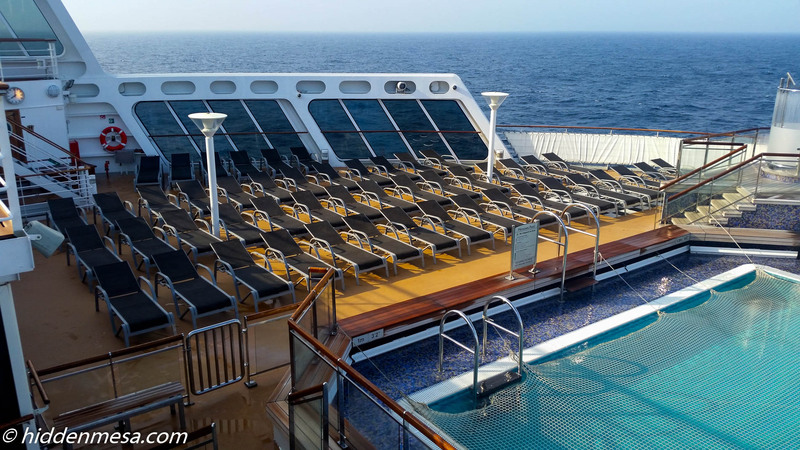 Deck 7, the Promenade, has a lot of chairs so you can enjoy the view on a sunny day. Photo by Bonnie Fink. 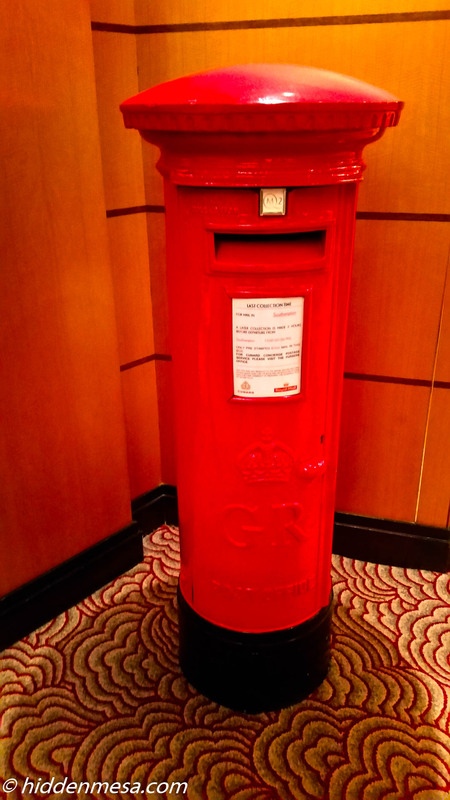 If you want to send postcards home there is a convient mailbox in the Lobby. Photo by Bonnie Fink. The Kings Court has several tables with a nice view. Photo by Bonnie Fink. Lots of lounge Chairs near the Minnow Pool. Photo by Bonnie Fink. 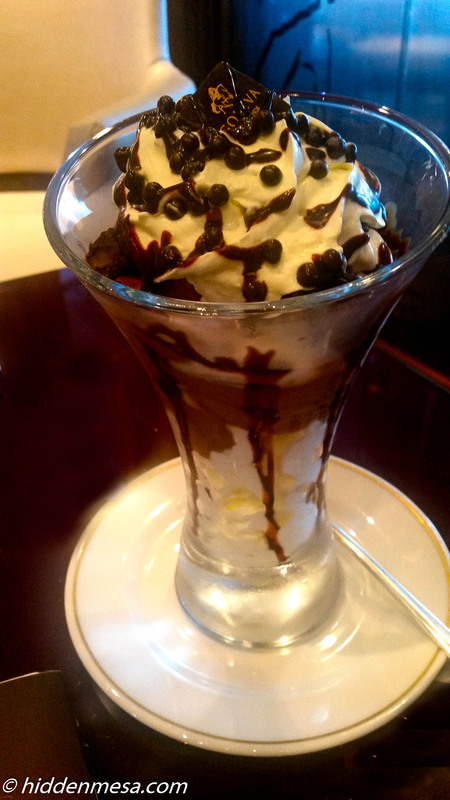 Choco-licious Chocolate Sundae at Sir Samuel's. Photo Bonnie Fink. If you wish to make the crossing with your pet, there is a kennel waiting for you. You can come visit your pet and take him out for a walk in the Kennel Area. Photo by Bonnie Fink. Queen Mary 2 signage. Photo by Bonnie Fink. The Pavillon Pool is a nice area to swim or just enjoy some live music in a covered area. Photo by Bonnie Fink. Art work near thePavilion Pool. Photo by Bonnie Fink. Extra props for the ship, that double as art. Really. 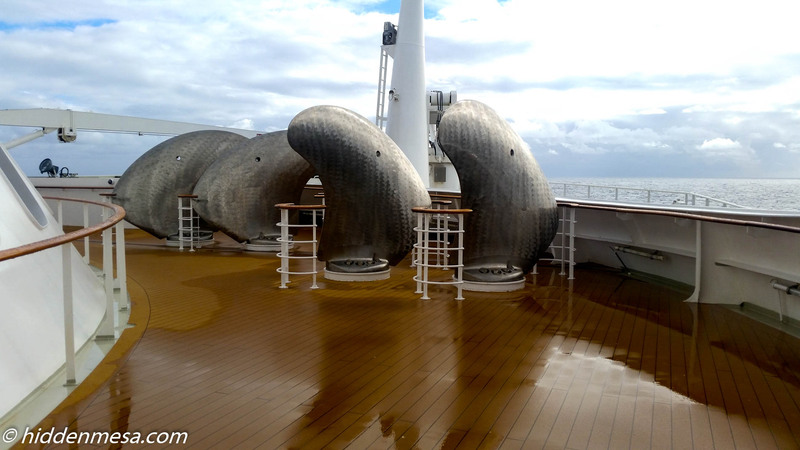 These solid stainless steel structures are actually spare props for the ship. No idea how you might get them to the business end of the ship since they're displayed on the bow. Photo by Bonnie Fink. The Promenade on Deck 7 also used for walking and running. three laps equal about a mile. Photo by Bonnie Fink. 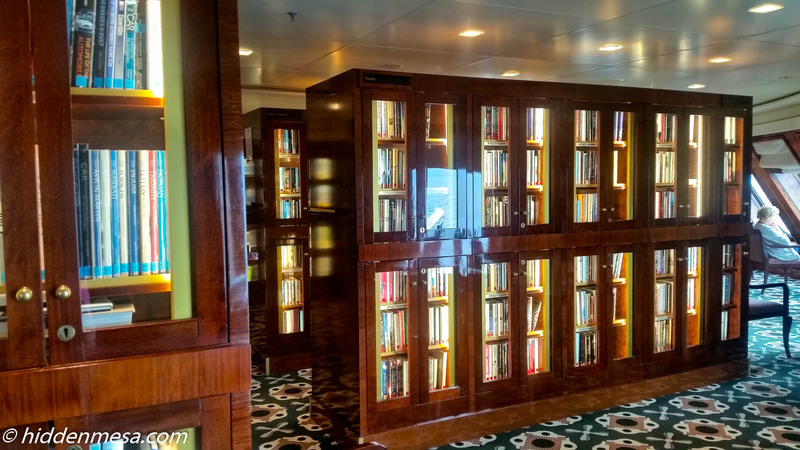 The Queen Mary 2 has an extensive library. A very cozy place to sit and read. Photo by Bonnie Fink. 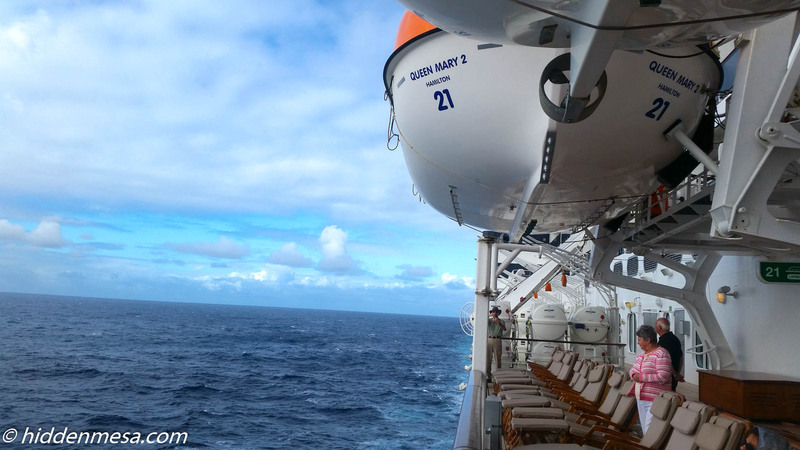 Life boats and balcony cabins. Photo by Bonnie Fink. 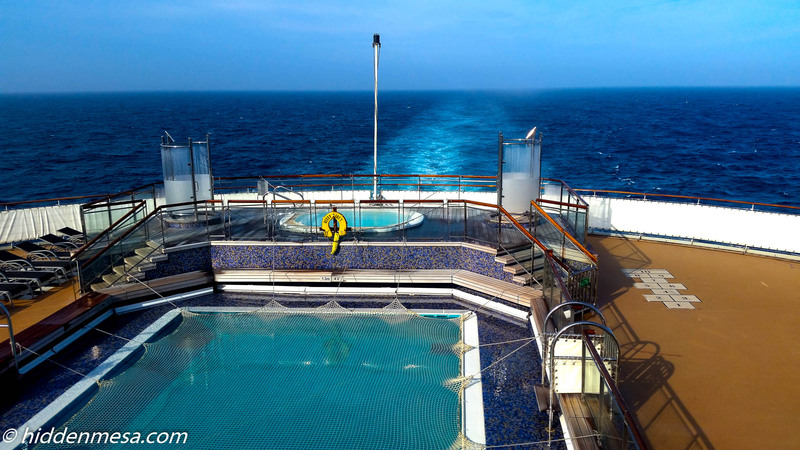 The Terrace Pool is one of three pools on the Queen Mary 2. Photo by Bonnie Fink. The Promonade Deck a great place to watch the world go by. Photo by Bonnie Fink. Watching the world go by on the Promonade Deck. Photo by Bonnie Fink. 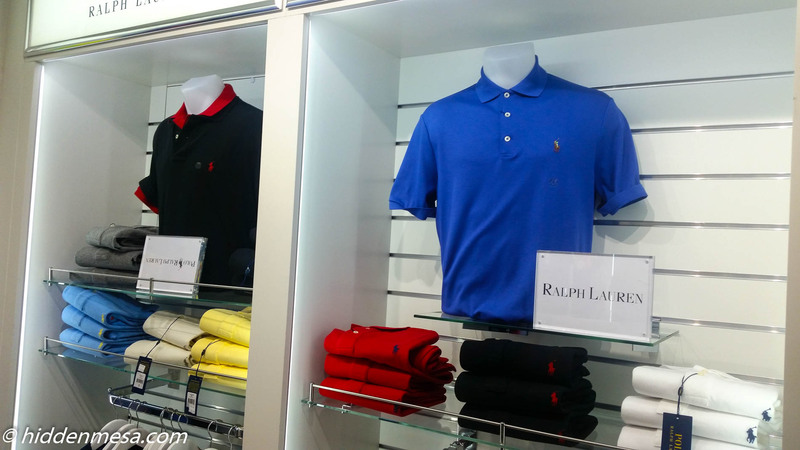 If you feel like shopping, you can buy Ralph Lauren, Michael Kors, Barbour,and many more. Photo by Bonnie Fink. 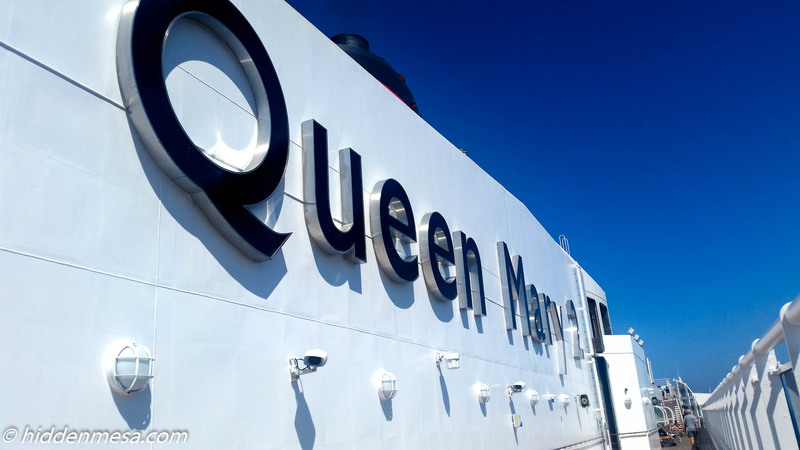 Enjoyed your report on QM2_ found it very informative,helpful and professionally presented. As result my wife and I are now booking a transatlantic voyage for next year. Thanks for your kind words about the article David. We hope you’ll enjoy the cruise. Be sure and let us know how it turns out.